Melanie Bacheler, at 32, was a full-time pharmaceutical company sales representative, part-time gymnastics coach, and a new mom of a six-month-old when her mother Gail Parkins was diagnosed with stage 3 ovarian epithelial cancer. By the time her cancer was discovered, it had already advanced through Parkins’ abdominal cavity. Her mom needed her, so she quit her sales job to become Parkins’ main caregiver. For two years and two months, until Parkins’ death, Bacheler shuttled her mother back and forth to Duke University Hospital and sat with her during treatments. Parkins, a teacher from Texas and mother of two, who’d spent her career teaching fifth-grade in Fayetteville, North Carolina, died in 2002 at the age of 56. Bacheler also wanted to find a way to give back to her mother’s doctors after all they’d done for her. So, in May 2002, in her mother’s memory, she organized the Gail Parkins Memorial Ovarian Cancer Walk to benefit ovarian cancer research at Duke. The two-mile route, which started and ended at a shopping center near her house, attracted 200 participants, including 20 survivors, and raised $62,000. It was held in May, close to Parkins’ birthday. That was 16 years ago, and the event — now a walk and 5K run — is still going strong. 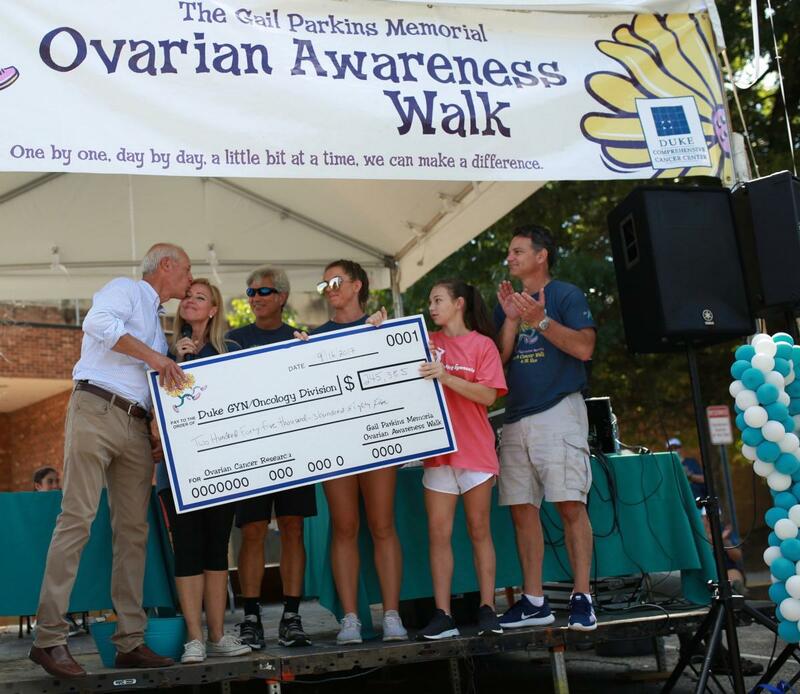 Bacheler said the walk’s become “a spiritual event for the ovarian cancer community” — an annual opportunity for friends and families from across the country to reunite and raise awareness and funds for the cause. “It’s truly inspiring for the ovarian cancer survivors, some 20 years out, some 20 days out, to have a place to come together and be happy and celebrate survival,” she said. Coordinating the event, year-after-year, has become a full-time job, a labor of love for Bacheler. The $3.8 million or so that the event has raised since 2002 has supported studies on the impact of ovarian cancer treatment on quality of life as well as research into how genetic alterations impact disease progression and how these alterations might suggest potential new therapies. Andrew Berchuck, MD, director of the Division of Gynecologic Oncology and Duke Cancer Institute’s Gynecologic Cancer disease-site group, has been involved with the event since the beginning; walking or running for the cause and hosting an on-site educational forum. Bacheler expects more than 3,000 participants at this year’s walk and run, to be held on *Saturday, October 27, at the Sertoma Arts Center in Raleigh, North Carolina. Bacheler’s daughters Brooke, 19, and Lindsay, 15, (a high-level gymnast) are captaining the family team Gail’s Fighting Gymnasts. The 5K run starts at 8:30 a.m. and the 2-mile walk starts at 10:30 a.m. At 9:15 a.m. Berchuck will lead an ovarian cancer educational forum themed “It Whispers, So Listen.” A $35 advance registration fee includes an event t-shirt, a Dunkin’ Donuts breakfast, and lunch provided by PDQ. There’s also a kid’s area with inflatables where Freddy’s will be serving ice-cream sundaes. To join us in the fight against cancer, support Duke Cancer Institute and follow #MyDukeCancerStory on Facebook and Twitter. Interested in sharing your #MyDukeCancerStory? Email dcidevelopment@duke.edu or call 919.385.0039. *An earlier version of this article listed Saturday Sept. 15 as the date of the walk, and at a different location. Due to Hurricane Florence, the event was rescheduled for Saturday, Oct. 27. It will be held at the Sertoma Arts Center on 1400 West Millbrook road in Raleigh, North Carolina, on the Shelley Lake Greenway. Find more information here. CIRCLE PHOTO (TOP): This is the photo of Melanie Bacheler and her mother Gail Parkins that sits on her desk. It was taken when her mother turned 56. Bacheler hosted a big surprise birthday party for her mom with 75-plus people. She rented a limo for the two of them to get their nails done. It was the first time her mom had ever ridden in a limo. Parkins passed away the following January. Duke Cancer Institute constellates the world-class resources of Duke University, Duke Health and the Duke Comprehensive Cancer Center into a collaborative powerhouse. We are poised to drive a paradigm shift in the way long-established cancer centers and institutes have been waging this war.